Making old new! When we first got married we rented a small one bedroom apartment for a couple of years leaving us with only enough room for a small table with two chairs, so we finely dined at a card table with folding chairs. 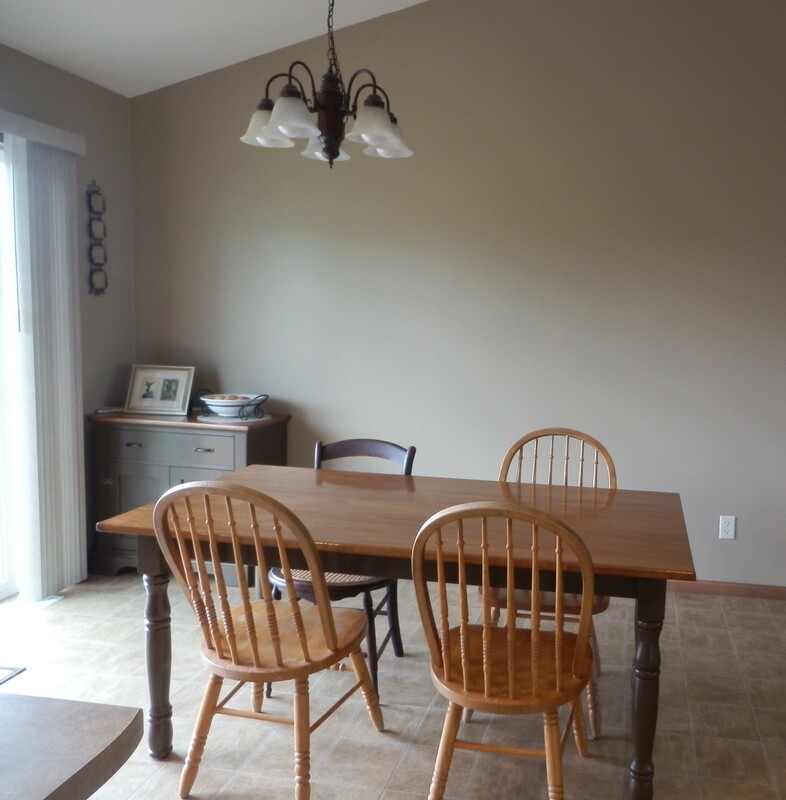 When we bought our first house, my husband’s brother and sister in-law gave us their old dining table and a couple of chairs they were able to salvage after over a decade of use and five kids. My husband refinished the table, sorry no before and after pictures and he would have to explain the steps. 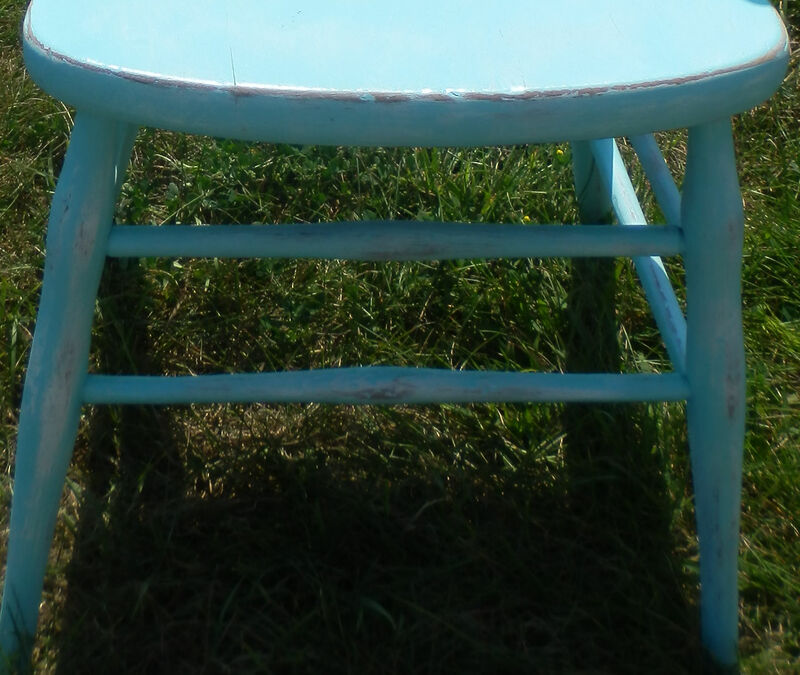 I was able to get a couple of mismatched chairs from my mother in-law that had been sitting in her attic for a few decades. 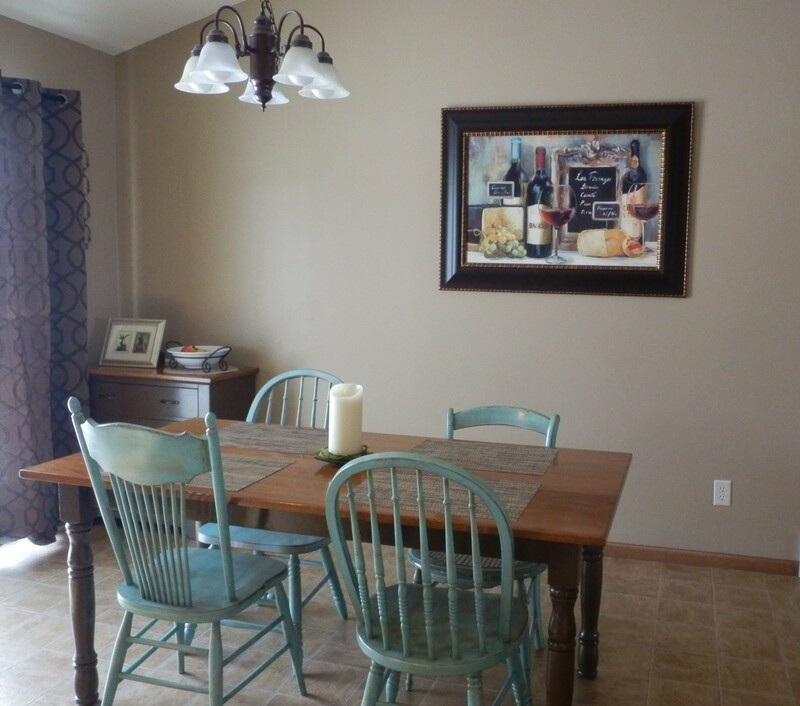 With a little inspiration and some help from a friend to get started, I embarked on the project of bringing color to the dining room. Step 1: Sand down the chair using a medium grade sandpaper. I just did it by hand, enough to smooth it over and take off loose paint. Step 2: Apply a coat of primer spray paint. One coat should be plenty depending on the quality of the primer. Step 3: Color! I chose a robin blue spray paint (needed a little encouragement from a friend to go with something so bright)! I used Krylon, it’s an indoor/outdoor spray paint made for wood, wicker and metal. It worked great and covers very nicely. Step 4: Distress. Depending on how much of a worn look you want will depend on the grade of sandpaper you use and the amount of elbow grease applied. Step 5: Apply stain. I used a darker stain, as I wanted to tone down the brightness of the blue and bring out more of the wood and brown hues. I made sure to only dip the tip of the brush into the stain. Also, I blotched it on a piece of rag once or twice to get the excess off, this helps to prevent too much stain being applied. I used Miniwax Wood Finish. Nice job, beautiful and adds lots of character. That does look nice. I repainted an old dresser… Spray painting would have saved a lot of time. Did you use a face mask for the distressing? Very Cool. It’s a nice pop of color.